It’s been a crazy week. After getting back from New York late Monday night it was a mad dash to finish two days worth of contract work and everything I needed to do for the Bazaar Bizarre and When Creativity Knocks (both at this past weekend’s Maker Faire). I only slept 5 hours each night, during which time I had several stress dreams, including having to perform a trapeze act in front of thousands of people with only ten minutes training by a hairy, naked French woman. I ditched the circus as soon as I realized my face wasn’t on the poster and the audience wasn’t expecting me anyway. There were a few snags, like having to leave Eleanor on her own to finish the last hour of mock-ups, and not being able to find the catnip, bells and beans I needed for the WCF steak cat toy demo, but everything got done in the end and the results were fair to good. The Bazaar Bizarre raffle looked fantastic (thank you volunteers and friends/family of Jamie! ), the demo went smoothly (though I had to omit the filling step), and the Sweet Meats sold really well. In fact, all the vendors did really well. Everyone kept remarking on how the recession didn’t seem to exist inside the Maker Faire. Maybe the attendees save so much money by growing their own food and building their own vehicles that they have plenty left over to spend on plush meats and robot soap dispensers. I love that the Maker Faire Bazaar Bizarre helps me pay my June rent, but I get a little sad that I can’t attend it anymore. I got to go the first year, which was awesome, but it’s so much bigger than it used to be and all of the new stuff is so tempting. I want so badly to ride the two-person ferris wheel, but my short lunch break doesn’t allow time to wait on the long line. This year many of the exhibits were open on load-in day (Friday), so I got to see a few things after setting up that night, but I had to work all that day, so my participation there was limited to about half an hour. Next year I’m going to load-in first thing on Friday so I can spend the rest of the day exploring the exhibits. Not everything will be up, but I’m sure it will still fill the day. 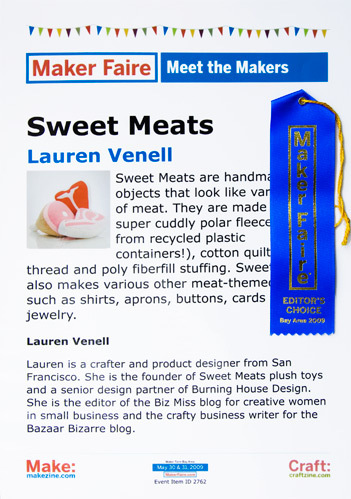 One highlight of the Faire was getting an Editor’s Choice ribbon from Becky Stern at Craftzine. I’ve been secretly coveting one of these for years (I’m a HUGE fan of Craft) and it gave me a nice “mission accomplished” feeling at the end of an insane week. The day after the Maker Faire was my birthday, so I did a little shopping for myself on Sunday. I got an awesome tool apron from Polly Danger (I made her assistant take off the one he was wearing and hand it over), a sweet little wrist wallet from eleen, and the most awesome snail mail stationery set from Jill K. in L.A. My friend Lydia moved across the country to Pittsburgh so I am currently writing her real letters on ugly stationery I bought in high school with lots of cross outs. She types on lovely onion skin paper using an antique typewriter. I think the snails will help bring me a step up. When I first saw the stationery in L.A. I was determined to buy a set even though it seemed expensive to spend $5 for one letter’s worth of paper and envelopes. Then I heard a man at another booth explain to his wife that of course he was going to buy this $6 card, because he couldn’t think of anything better to spend his money on than a way to meaningfully communicate with his friends. I couldn’t agree more.